A much better turn-out than usual, 7 of us assembled at the Peebles car park for a 9am start. Only 3 of us were MV regulars - me, Sandy and Sheelagh. The others were friends or colleagues of Sandy’s; Andy had a very smart road bike; Peter and Shona are regular cyclists and live Falkirk way; Alan also cycles regularly. As for weather, it was one of those ‘3 seasons in a day’ sort of days; we managed to dodge most of the showers, but the wind was always a presence. It wasn’t a cold day, so long as you kept moving. We stopped at ‘Laurelbank’ in Broughton for morning coffee as usual. The Crook Inn is still looking what Aussies would call “crook”, but there are small signs that things might be moving on. We stopped for al fresco lunch as usual at the Cappercleuch Telephone Exchange (thanks, BT! ), where I sat in deep comfort in a bed of beech masts, but had problems getting up again after! Clearly there was a need for some warmer comfort, and luckily the Gordon Arms was open, and seems to be doing good business, so we gave them some more. At Traquair was a parting of the ways; Andy’s road bike did not fancy an old rail path, and I chummed him along the B road, believing this road is not only shorter but also more sheltered by the hillsides. The others carried on to the rail path at Innerleithen and arrived in Peebles 15 mins later than us - but our distance meters all read 50.5, +/- 0.3m. It was great to get back in full daylight, and without fingers covered in icicles, so this earlier slot in the year was certainly welcome. Six of the eight booked for the trip made it to the starting line at the Allanwater Café, Bridge of Allan, where we all succumbed to a second breakfast. Alistair deserved his as he’d already put in a few miles, getting off the early train at Stirling. Our ride began by taking us back past the station, then left onto a quiet road (marked ‘abattoir’) via Old Keir, Craigarn Hall and Shrubhill. Turning off at the market cross in Doune, we crossed the River Teith, catching a memorable glimpse looking back up the river to Doune Castle. The peaceful B822 loosely followed the path of the River Teith. After a stop for home-grown plums I’d brought (I wanted to offload the weight early!) the route took us onto the B822 before it merged with the A81 into Callander. Circumventing Callander itself, we joined Route 7 and were soon picnicking at the east end of Loch Venachar, the first of our 5 lochs. This was a picturesque spot with views down the loch and out over the surrounding hills and woodland. Cycling on we passed a sign about closure of the Venachar path but on reversing for a closer read it turned out to be for the following afternoon, so luckily our plans weren’t thwarted. The path twists and turns through woodland around the southern side of the loch close to the water, making it a game to balance enjoying the views over your right shoulder with navigating the path. The way opened out to forest track, looping round the southern side of Loch Achray, from where we took a short cut on a footpath that took us out onto the main road. From there a fun swoosh round the top of Loch Achray, absorbing the views for prosperity because a photographic stop would bring a halt to the free-wheeling, and soon we were stopping for coffee at the Trossachs pier at the foot of Loch Katrine. This was quite timely as it had started to shower. By offering a free table-clearing service we managed to acquire a large table with a view to enjoy soups and coffees above the comings and goings at the quayside. The rain was a little heavier when we left but it didn’t last long. 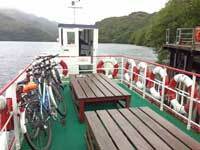 We stopped several times around Loch Katrine to savour the views and nibble on blackberries. The sun came out as we rounded the north western tip in stark contrast to the sudden wind and rain that had greeted Jenny and I at that point on the recci. Folk were relieved to hear that the steep road appearing on the hillside wasn’t our route, ours meandering into Stonachlachar and then out and up to Loch Arklet. From there it was a pleasant few miles along to Inversnaid. As it happened a party of 17 from Linlithgow had also booked into the Inversnaid Bunkhouse and were given priority for their evening meal. The group apparently walks the West Highland Way each year. However, we were able to make good use of the new kitchen and shower block that had opened just two weeks before. Our reward for not making a fuss about the delayed meal was complimentary starter prawn cocktails with huge prawns and tea/coffee at the end, complimented by a real treat of marzipan and chocolates from Barbara and Sheelagh. The hostel was converted from the original church building, St. Kentigerna's Parish Church, in the 1990s as an outdoor centre into its present configuration. The original stained glass is on display in the restaurant/lounge. The hostel’s featured hot tub was sadly closed so Alistair’s visions of sitting in it surrounded by 5 scantily clad women failed to come to fruition. We had a lazy start to the Sunday as the first ferry across Loch Lomond didn’t depart until 10.30am. This first ferry is extended for the tourists and chugs up to Rob Roy’s cave first, across to Inveruglas and then down to Tarbet (the differences between Tarbert/Tarbet was a topic for discussion). We learnt about the MacGregors and the McFarlanes interspersed with lively traditional music. Alastair and I did a very brief Gay Gordons at one point but luckily there’s no photographic evidence. The heavens opened as we neared our destination but as we pulled into Tarbet pier the rain miraculously stopped and we got off to a dry start. There were a few showers later so, despite the views as we headed south on the West Loch Lomond cycle path (Route 40), we felt lifted reaching the lunch stop. As the Luss Visitor Centre was unexpectedly closed we cycled through Luss itself, appreciating the pretty cottages used for the filming of Take the High Road, and found the Coach House. 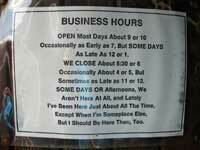 This was memorable for (a) its tartan crockery, (b) it’s good service and (c) the unexpected appearance of cyclist no. 7, Susie, who’d come to join us for the rest of the day. I couldn’t fathom how she’d found us. The showers continued so we omitted the short optional loop through Balloch Country Park and joined Route 7 heading south along the River Leven to Dalreoch. Two left us here for the train back to Edinburgh. Then on to Dumbarton where we picked up an old railway line to Bowling, the start of the Forth & Clyde Canal. Clydebank provided a coffee stop where Ann and Susie debated a complex maths challenge on a serviette. Susie and Alastair chose apple pie that came with both ice-cream and cream, swapping one for the other with each other according to taste. At Westerton where the canal meets the railway we parted ways, those heading for Edinburgh being lucky enough to catch a direct train home. This was quite a varied trip with lochs, woodland, quiet roads, cycle paths, a ferry crossing, a river and canal, great company and changeable, but on the whole, pretty good weather.
" The Infamous Five"- Me, Vic, Jenny, Alec and David. 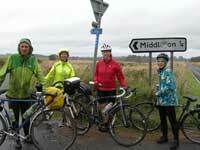 Despite a very wet forecast, five hardy souls turned up for the Craigie Farm ride. The Weather Gods were kind, and we made Craigie Farm at 10.30, before any rain, and enjoyed our coffee and cake in the Potting Shed Room, - too cool to sit outside on the patio this time - but still great views! 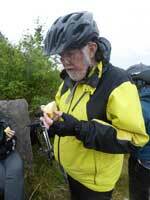 We set off for Ratho about 11.30, and hoped to make it before the predicted heavy showers. We just about did! - but at Newbridge one of the party had a puncture (a thorn!) Bad luck! - but with Vic as main mechanic, and some team work, we got it fixed as rain started. We made Ratho just as the heavens opened, and had our picnics in the outside covered area (no smokers! too wet!) at The Bridge Inn, which was packed to the gunnels with folk having Sunday lunches! We got teas and coffees to have outside, and stayed dry! The rain eased, and we ambled along the towpath back to Edinburgh, as the sky cleared. Thanks to everyone who came. We enjoyed our leisurely day out. Hope to see newcomer David on another of our cycles. Five of us (Tiana, Sue, Anna, Kathy and Keith) met in the café across from Galashiels train station Bikes wheeled in and under cover we enjoyed our pre-cycle scone and coffee in traditional MV fashion. After our ‘well earned’ break we followed the pavement cycle path to Clovenfords than up and over the hill to the lovely private tarmac road at Dryburn, along the almost traffic free old stage road via Fountainhall to Heriot. Here Tiana suggested going straight ahead, across the fields – it cut out a lot of B road but meant crossing two fields of cattle. There was some nervous checking that the cows were indeed cows. Fortunately the only bull spotted was in an adjacent field. Skittering on the mud and discussing the type of beet grown by the farmer, it probably took as long as the circuitous way, but it gave a more interesting route. By now it was getting damp, Sue set off for the station, the rest of us took a quick look at Borthwick church and school house first. Anna decided against a stop whilst Tiana, Kathy and Keith, now in full waterproofs, arrived at Newtongrange mining museum café only to find a wedding reception in progress! If only we’d been wearing kilts! Kathy tactfully negotiated our entry past the beautifully attired bridal party to the tea room where we had a welcome pre-train refreshment. Unfortunately our only photo is of us at the Roadside. After a month with hardly any rain the heat wave chose to break on this weekend. The plus side was that it would be cooler but the forecast showed rain for nearly every hour. Thunderstorms on Friday disrupted the rail services but the knock-on effect on Saturday was that everyone arrived at Alnmouth station within one half hour period! 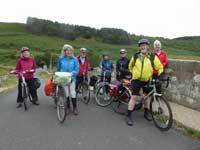 We set off on the NCN1 northwards taking the inland route at Boulmer and again just before Craster to go to a new café for us – Eleanor’s Byre at Spitalford. We arrived as it started to rain and thought that we’d have to sit outside but our disruption of the peace and quiet chased away the occupants of one of the tables so we all piled inside. Fortified by delicious cake we set off northwards again. Bamburgh was busy but we managed to get into the café for some lunch. Back outside it was now bright and sunny so we voted for going over the moor. We set off south westward and suddenly found it was a lot windier than we had realised! 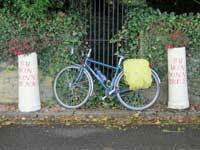 The route winds along small roads, one even gated, to get to North Charlton where there is an underpass to the A1. Emerging into the sun the other side again the vote was to sample a new café, Carnaby’s, half a mile away. They had a good array of cakes and savouries on display even at 3.30pm! The rest was good for it gave us the energy for the five mile slog up onto the moor summit near Ros castle. We rested at the roadside to catch our breath before the sharp descent into Hepburn. Criss-crossing more gentle roads westward to the A697 at Haugh head. 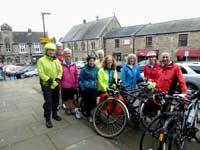 Here the group split as only two had the energy to head up the stony path to the NCN68 high route to Wooler, the rest zooming along the main road and climbing through town. I had brought a summer pudding, a compulsory dessert during the fruit picking season, and we purchased ingredients for the main course from the co-op. Paul had mentioned in passing that it was his birthday so we secretly purchased a lemon drizzle cake that the co-op had thoughtfully placed by the entrance. Some had difficulty rising on Sunday so we decided to return to Berwick along the familiar Etal – Norham route following the NCN68. On the off-road section before Doddington we passed a bench offering rest and a grand view. It being 11o’clock the birthday cake was produced for elevenses. Just outside Ford the rain started so we decided that there was more to occupy us at Heatherslaw than Ford should it persist. However most preferred a leisurely lunch than a walk round the exhibition. 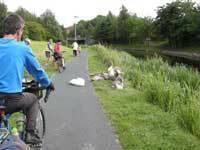 We left as the last drips fell to tackle the badly signed and worst surfaced section of the NCN68 (Etal to Duddo). We stopped at Norham for what was intended to be a quick look at the castle only to discover that Paul had a puncture. It is difficult to find a puddle on a hillside even if it is raining! But it turned out to be a faulty valve. The two folk catching the early train left ahead, but we caught them up at the Honey Farm. The rest of us had time for a leisurely cuppa before heading to Berwick. What do we know about the Romans in Scotland? After various delays, we set off from Carlisle Station via the upgraded Rickerby Bridge towards Brampton. There were 8 of us: Maura, Tiana, Alec, Kathy, Euan, Henry, Vic and Barbara. Jan was to join us on Saturday. Vic had arrived with his wife, Jenny, who had the car. She later carried the two cakes Tiana had cooked. Jenny and Vic had offered to cook dinner for us on Saturday. That’s a first for Mellowvelo. We had the Sustrans map (invaluable) and OS maps too. Our route for almost all the weekend was NCN72 which was well signed except in Newby East where some joker had turned the sign the wrong way. Alec climbed up to correct this. As the hills got steeper the usual Mellowvelo camaraderie kicked in. After a pleasant ride in the sunshine, the sky changed colour and the forecast thunderstorm hit us at 1.30. It seemed to last for ages. We were relieved to arrive in Brampton and get a late lunch at Brown’s café. Tiana had by-passed Brampton and gone on to Lanercost Priory where she met Jenny. We climbed out of Branpton and soon after Banks Turret, stopped to admire the Wall and read the information boards. In Haltwhistle we got the necessary wine, etc for dinner, climbed again and then left NCN72 at Meikle to climb north, direct to the hostel. The final mile was probably the worst of the day. The Sill complex, opened in 2017, comprises the National Landscape Discovery Centre and the new hostel also called The Sill. 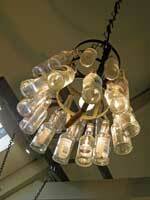 It is large with an open-plan restaurant/drinks available at the entrance. All the doors are activated with key cards. The drying cupboard was a good size but had no racks just hooks round the walls. The bike shed was rather small. The dormitories (not ensuite) had wall-hooks and two half-sized cupboards. The whole building was very warm – not sure why. We bought our dinners in the restaurant on the Friday – good menu and friendly chef. There was a notice saying only alcohol bought there would be allowed. We celebrated Tiana’s birthday with her raspberry and polenta cake. Most of us visited the National Landscape Discovery Centre during the weekend and were very impressed with the displays and the Whin Sill Grassland Roof which reflects the shapes and geology of the Great Whin Sill. 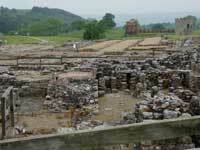 On Saturday, we all visited Vindolanda – some all day. Others went to the Roman Army Museum, 5 miles west and/or had a ride north of the hostel. We were very impressed. The volunteer guide really brought the site alive for us – the stories, the shops, the history and the current archaeology. There had been nine forts built on the site (of wood then stone) over nearly two centuries. We were delighted to find that a new museum on site had been opened this year. 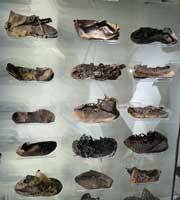 It housed the large collection of Roman sandals and some of the famous wooden tablets from the first century with all manner of personal messages. They are the first known use of ink. The rest of the tablets are in the British Museum. We returned to the hostel to share our day with Jan, Jenny and Vic. In great spirits, we set a large table for dinner and were delighted by the vegetable casserole and chicken curry cooked by Jenny and Vic followed by a rhubarb and orange cheesecake cooked by Tiana. Sunday promised better weather and fewer hills. We climbed to Grindon Hill, where Vic joined us. In Fourstones, we left NCN72 going south-east, crossing the railway line to pick up NCN72 again at Bridge End. We were soon in Hexham for coffee and on to The Corbridge Larder for an excellent lunch. Tiana visited Corstopitum Roman Fort and then joined us for lunch. Continuing east, we entered Tyne Riverside Country Park along the Wylam Waggonway to the birthplace of George Stephenson (1781 – 1848). He was called the ‘Father of Railways’ but we decided to call him ‘Original Rocket Man’ (aka Kim Jong-un ). Continuing through the Park, we found the café closed but were delighted to catch the ice-cream van. In good spirits we were soon on the outskirts of Newcastle, taking the dedicated track into the city. At the bright blue bridge, we turned north and were at the station by 5 p.m. There, we had to cope with various train timetable alterations (new summer timetable) and mis-instructions. Some tickets and booked bike spaces even had to be altered. Overall we tried to be patient. Everyone got home safely. Several people will be claiming refunds. We all seemed to enjoy the weekend and came home fit and cheerful, well informed on our Roman heritage. Alec, Barbara, John, Keith and Tiana met at Oxenhome station. The ride started with a steep climb away from the station on a busy road, with no opportunity to warm up beforehand. The hill wasn’t long, fortunately, and we left most of the traffic after another mile. We hadn’t left the hills behind, though – far from it! The road went up and down vigorously, crossed the motorway and ran alongside the West Coast Main Line. Several people were waiting with cameras in expectation of a steam special, which was running late. We were lucky! – the promised steam engine came thundering along the line, evidently working hard on the climb to Shap summit. Alec identified it as an ex-Southern Region Merchant Navy class locomotive, British India Line. A steep descent brought us to the Lowgill Viaduct, which is an impressive stone structure where a line from Kirkby Lonsdale used to join the West Coast Main Line. 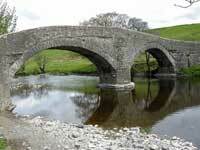 Another brake-testing slope took us down to the River Lune, where we stopped for a picnic lunch. It would be an ideal spot for a park bench but we had to make do with stones on the embankment. (I wonder whether any seats had been washed away by Storm Desmond, which damaged the parapet of the bridge.) Inevitably we had to start again by climbing away from the river, the first ascent with an arrow on the map (gradient between 15% and 20%). 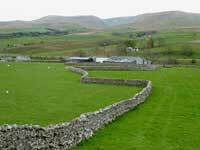 At Howgill we met an old Roman Road that runs north-to-south along the western edge of the fells. We turned north, pedalling in and out of the valleys carrying becks from the fells. One section is appropriately named Fairmile and gave a glorious view of the narrow Lune valley that carries the M6, West Coast Main Line, A685 and our narrow lane as well as the river itself. The route joined the A road for a mile before returning to a country lane, but this turned out to be the longest climb of the day (which I had not foreseen, having done the recce in the opposite direction). 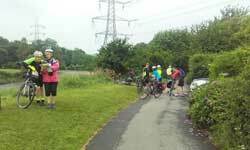 The route had been on NCN70 until now but we decided to cut a corner to be sure of reaching Orton before the café shut. We succeeded and felt that we had earned our cakes! I had originally planned to continue on NCN70 but we were running late so we dropped back into the Lune valley and rode through Kelleth, Newbiggin and Ravenstonedale, all pretty villages with stone buildings. We had to ride on the A683 for a couple of miles but it carried little traffic and was pleasant enough. 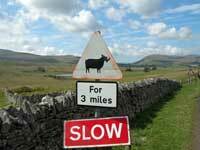 The same cannot be said of the A685, which we had to take for the last stretch into Kirkby Stephen. This was busy with idiot drivers but it was downhill so the misery did not last long. We reached the hostel around 1830, having taken 7 hours to ride 35 miles. Kirkby Stephen hostel is in a former Methodist chapel and did not live up to its former reputation for being chilly. The warden, Denise, was away (as happened last time – is our reputation that bad?) so her sister Karen provided a vegetable casserole followed by bread-and-butter pudding. We spread over two rooms, which was luxury, and had a comfortable night’s sleep. We made our own breakfast, including leftover bread-and-butter pudding. I had planned a route that climbed a major hill (with the possibility of taking a train through the hill instead if we timed it right) but decided on a more moderate tour instead. We left town on the B6259 and stopped after a few easy miles to look around Pendragon Castle, the ruins of a Norman keep on a picturesque site by the River Eden. We couldn’t avoid hills for long and climbed a lovely road up onto the moor, prominently signposted ‘Do not follow sat nav’. This took us back to the A683 from yesterday and we followed the road south. Some wag had modified a sign to warn us about a rhinoceros on the road! At Cautley we stopped for coffee at the Cross Keys. This is a 400 year old temperance inn owned by the National Trust. In the distance we could see Cautley Spout, which is the highest waterfall in England (spread over several falls). It was too far to walk to in and the path was being used for a marathon from Sedbergh so we sat in the sun and enjoyed the view. 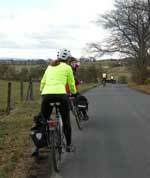 We approached Sedbergh after a few more miles, downhill all the way. Rather than go through the town we took a diversion on a narrow lane and joined the road into Dentdale. This is a lovely valley and was less busy than I had feared. We had no trouble finding a table for lunch at the Heritage Centre and could have spent more time looking around the displays. We returned along the valley to Sedbergh, after which we met the hills again. It was a long slog out of town, passing Howgill Fellside Ice Cream on the way. This took us back to the Roman Road, whose straight line on the map obscures the steep sides of the valleys that it crosses. 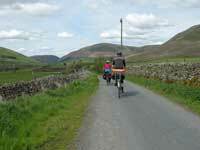 A few miles took us to Howgill Junction and we returned along the hilly route that we rode the day before. I had over-compensated for our slow progress and we were now well ahead of schedule so we stopped by the River Lune in the sunshine. Fish were jumping out of the river, presumably catching insects. It was about 10 miles to Oxenholme, where all the trains were delayed because of an incident toward Lancaster so we got home rather later than planned. Parts of this route were excessively hilly, which I didn’t fully appreciate until I did the recce and it was too late by then! That’s the hazard of proposing a ride that you haven’t tried. We climbed five slopes with gradient arrows on the map and many more hills were almost as steep. Conditions were glorious, on the other hand. 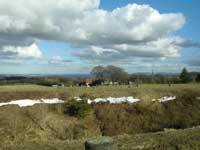 It was high spring with lambs bleating and birds singing. Goldfinches flitted along the hedgerows. The bluebells were at their best and the verges were brightened by cowslips, ramsons, primroses, forget-me-nots and a few orchids. A grand weekend. The strategy for the weekend was to stay at Oban hostel for several nights, and then use ferries to visit a different island each day, so that most of the luggage could be left at the hostel. Here are a few organisational points which we discovered. 1. There are 6 cycle spaces on each train from Glasgow to Oban. 2. Scotrail was offering a fare between Oban and Glasgow which was less than half the price of a ticket between Connel and Glasgow! This discouraged the idea of starting or finishing a ride at a station other than Oban. 3. The times of the car ferries from Oban to Lismore on Sunday were altered for summer 2018, so that Sunday is now the most convenient day of the week to visit Lismore. Weather over the weekend was ideal for cycling: no rain, often sunny, but not too hot, and enough breeze to keep us cool, but not to make cycling hard work. Five people booked for the Mellow Velo Oban weekend. One chose the last train, and reached the hostel before 10pm. Of the four who travelled on the 1221 from Glasgow, three arrived extremely early at Glasgow Queen Street, and were given VIP treatment by one of the station staff, who, without being asked, approached everyone who had a cycle, and asked them if they were going to Oban. He then personally led us through the barrier to the cycle storage place at the furthest end of the Oban train. I recognised him as the Face of Scotrail, who had appeared on the cover of last year’s Scotrail publicity. He confessed he was a cyclist himself. Hence perhaps the VIP treatment! Not long after we departed, it was announced that there was a technical problem with our train. At Ardlui, all passengers, with their bikes, had to swap trains. The train FROM Oban then carried us TO Oban, without further problem. Tiana had volunteered to organise the evening meals on Fri and Sat, and we were in Oban in good time to get to Tesco to shop for the ingredients, which she had carefully chosen to meet our various dietary requirements. Saturday 28 April. Isle of Mull. We chose to take the 0950 ferry from Oban to Craignure. We had decided to do an out-and-back run from Craignure to Lochbuie, a total of 28.2 miles. This route skirts the heads of three sealochs: Loch Don, Loch Spelve, and Loch Buie. These seem to provide the economic base for the area: we passed a factory which processes shellfish, a mussel farm, and a salmon fish farm. At first, we were on a single-track A road with passing places, and quite a lot of traffic, including coaches carrying tourists heading for Iona, but after 6 miles, at Strathcoil, we branched off to follow the unclassified road to Lochbuie, on which we met very little traffic. At the corner we stopped to examine a monument. 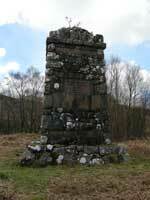 It commemorated Dugald MacPhail (1818-1887), a Gaelic songwriter, poet and author, who was born at Strathcoil. He is best known for the song An t-Eilean Muileach (The Isle of Mull), now known as 'Mull's National Anthem'. Strathcoil was the start of the only serious climb of the day, an ascent of 330 feet, steeper than 1 in 7, which forced most but not all of us out of the saddle. 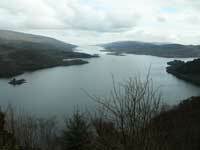 From the top, we had great views over Loch Spelve, before we made a cautious descent down the south side. Apart from this, the whole of Saturday’s run was gently undulating. Most of it was over open moorland, and along the edge of a sea-loch. The exception was the glen which the road follows between the SW end of Loch Spelve and the NE end of Loch Buie. This glen is filled by the fresh water of Loch Uisg, and its slopes are clothed in delightful woodland. We emerged from this into the flat pastureland at the head of Loch Buie. 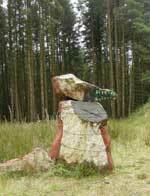 We had read that there was a stone circle here, consisting of 9 stones up to 2m high, with 3 outlying stones up to 3m high. We left our bikes, and tried to follow the path-markers across the field, but it was so poorly-drained that we gave up and returned to the bikes, without seeing the stone circle! 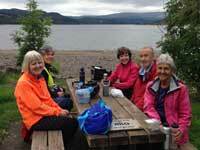 There is no village, nor café, nor shop, nor Post Office at Lochbuie, so we had taken a packed lunch with us. But Lochbuie does have a unique facility known as the Old Post Office, located in a wooden hut at the top of the beach, which can provide shelter, drink and food in an emergency. We ate our picnic lunches, sitting in the sun on the bench outside the hut. 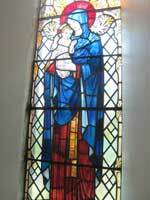 After lunch, some of us had a quick look inside the small Episcopal Church consecrated to St. Kilda. 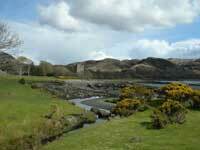 Then we took the track along the shore, first on the bikes, then on foot, until we could get a good view of Moy Castle. It is a 3-storey tower, standing at the head of Loch Buie, built in the 15th century by Hector MacLean, the founder of the re-named MacLaines of Lochbuie, who made it their home. It was abandoned as a residence in 1752 when Lochbuie House was built. The entrance door is locked now because of a risk of crumbling masonry. We returned from Lochbuie by the reverse of the outward route, which meant a second ascent and descent of the steep hill. 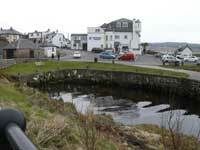 We were back at Craignure in good time for the ferry at 1705, and at the hostel in Oban about 1800. Total distance for the day was 30.2 miles. Sunday 29 April. Isle of Lismore. 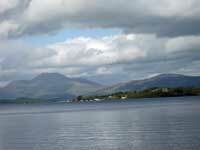 Lismore is served by two ferries, a car ferry direct from Oban, and a foot (and cycle) ferry from Port Appin. 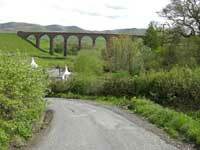 Consequently, we could include Lismore in a cycle run from Oban in any one of 3 ways. We chose the anti-clockwise circuit, starting by cycling northwards along the coast of the mainland, following NCN78, which is now largely traffic-free and hard-surfaced, then taking the foot ferry from Port Appin to Lismore, and returning by the car ferry from Achnacroish to Oban. This could give a distance of 30.5 or 35.5 or 40.6 miles for the day, depending on the exact route chosen. 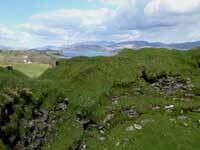 The official route of NCN78 goes directly inland from the centre of Oban, up Glen Cruitten. In the first 2 miles the road climbs from sea level to 360 feet, and then drops down steeply to 180 feet. But the reward is 3 miles of gently undulating quiet road across a plateau clothed in green pastureland, to Connel Bridge which crosses the mouth of Loch Etive. The first time I cycled across this bridge (1953) it carried both trains and motor vehicles (which paid a toll), by means of a sort of elongated level crossing, but the railway to Ballachulish has long since gone, to be replaced in many places by NCN78. Another 3 miles across a flat plain and we were at the village of Benderloch, where there is a café. As we had only done 9 miles so far, I offered the team a choice. Either continue and take in the Creran loop which follows the original route of A 828 round the head of Loch Creran, and would add 5 miles to our total. Or, stop at the café and take the short route using the new road bridge across Loch Creran (on the site of the former rail bridge). They chose the café and the shorter route! (I chose the shorter route in 1953, but I had to carry my bike over the rail bridge). I had intended to stop for lunch at the Creagan Inn, not the Boathouse Hotel at Port Appin, where they tend to ‘make a meal of it’. But Tiana pointed out that, at the Boathouse, we could just have a bowl of soup for lunch, so we decided to continue to Port Appin. 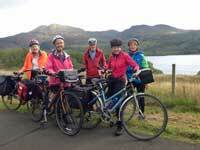 We avoided the gloomy forested stretch of the NCN78 in the Strath of Appin, and took the scenic route around the Appin coast, with views of Loch Creran, Benderloch, Eriska, and finally Lismore. We paused at Druimneil House where the garden is open to the public, and the rhododendrons and azaleas were just coming into bloom. We finished our soup in time to catch the 1400 passenger ferry to Lismore. The cycles had to be lifted on board. ‘Lismore’ means ‘Big garden’: it is one of the most fertile parts of the Highlands, because of its limestone foundation, and relatively low (but not flat) terrain. Today, we see mainly green fields used for pasture, but many show the remains of ‘riggs’ which indicate their former use for cultivated crops, in times of self-sufficiency. Most of our ride on Lismore followed the single-track road which forms the backbone of the island. Our first deviation was to Port Ramsay, a beautiful row of white-washed cottages, facing the sea. The cottages were built about 1800 to provide homes for those working in the lime-quarrying and fishing industries, and are still occupied. Our second deviation was to the Tirefuir Broch. The broch was bigger and better preserved than I expected, and on a higher and steeper hill, but we made it to the top. It has the typical form of a broch with a circular floor plan, thick solid walls at the base, and double walls above. Some parts of the interior between the double walls were visible (see photo). The Web says that it was probably built in the late Iron Age; but inhabited until the Middle Ages (12th century), as indicated by artefacts found which date from the Roman era, from the 8th century, and from the Norse period. The visit to the Broch took longer than intended, so it was 1545 (hours not years) before we arrived at the Heritage Centre, which closes at 1600. Sadly, the volunteer who looks after it had already left, so we were not able to see its displays. But the volunteers who look after the café were still there. We sat outside in the sun, as we had done at our morning and lunchtime stops. And this was in Scotland, in April! Then we had plenty of time to freewheel down to the ferry slipway at Achnacroish, to catch the 1700 car ferry, arriving Oban at 1755, and getting back to the hostel at 1805. The total distance for the day was 35.5 miles. Monday 30 April. Falls of Lora. Tiana had suggested that we could have an interesting morning viewing the Falls of Lora, at Connel. As Oban hostel is open 24 hrs, we could leave our luggage to be picked up on the way back to Oban station. Also, there is a shorter variant of NCN78 (5.4 miles) which runs directly from the hostel to Connel, though it is almost as hilly as the official route via Glencruiten (7.0 miles). The consensus was that we should again take the Glencruiten route. Tiana had consulted the Web, and told us that this was the best date and time to view the Falls. 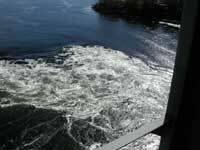 From the Connel bridge, we viewed the swirling waters directly below. Here there is a shallow bar of rock which makes the ebb tide act like a waterfall flowing from Loch Etive into the sea and, even more remarkable, also makes the flood tide look like a waterfall flowing from the sea into Loch Etive! At the time of our visit, the tide was ebbing, but the Web confirms that the Falls do work both ways: “they are more spectacular on the ebb tide but the view from the bridge eastwards on the flood tide is also impressive”. We then divided into 2 groups. The 3 cyclists booked on the 1441 train from Oban donned high-vis clothing and headed back along the A85 main road for 1.5 miles to a Garden Centre, which proved to have an excellent café. We then took the direct, tarred variant of NCN78 which branches from the A85 at Dunbeg, and descends by two terrifyingly-steep hills to reach the coast at Ganavan. 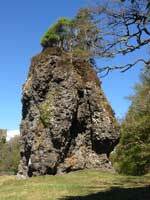 From here, a motor road runs along the textbook example of a raised beach all the way to the Oban hostel, passing on the way Dunollie Castle, and also a curious rock known as the Dog Stone. This appears to be a ‘Raised sea-stack’. The other two cyclists, who had booked on the late train, headed north to the Benderloch café where we had stopped the previous day, then spent the afternoon exploring the low-lying peninsula west of Benderloch village, and south to Loch Etive, before heading back to Oban via Dunstaffnage Castle. Photos: thanks to all members of the group, except myself! This was the first Mellow Velo weekend of the season. The previous week had had some very nasty weather, including heavy rain, sleet and snow, which did not bode well for the weekend. The weekend weather turned out to be not too bad, starting with low cloud and heavy mist but finishing with some sunshine. Mellow Velo has done the Five Ferries route several times, always clockwise. I thought of doing it anti-clockwise for a change, but the timings would have been awkward if we spent the night at Lochranza Hostel, so it was the same route as before. CalMac now sell a set of tickets called "Five Ferries Adventure", more convenient than buying individual ferry tickets, but no cheaper. Four of us met at Ardrossan for the 12.30 ferry to Brodick. After lunch on the boat and buying food for the evening's meal, we took the String Road over a 234-metre summit across the centre of Arran to a tea stop at Blackwaterfoot. After tea we went up the west coast to Lochranza. Three miles to the west is Kintyre, but it was invisible in the mist. Apart from the first mile out of Blackwaterfoot and a short 1-in-6 climb at Imachar the road is nearly flat all the way. Despite being an A road, long stretches were pockmarked with potholes, some of them sporting traffic cones as an extra warning. A few other stretches had recently been resurfaced; one wonders what their surface must have been like before. On the way we passed Dougarie Lodge, built in 1865 as a summer retreat for the Duke of Hamilton, with a picturesque boathouse built a few years later. At Catacol are the Twelve Apostles, a row of fishermen's cottages built about 1850; each has a differently-shaped upper window, the legend being "when the men were at sea, their wives could light a candle in the window and each man would know which house was signalling". 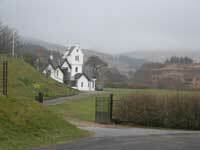 We spent the night at Lochranza Youth Hostel, arriving as it started to rain. The hostel was originally a hotel, built in 1894 to the design of J.J. Burnet, and was bought by the SYHA in 1943. Despite extensive alterations it still has some original features. On Sunday we set off from Lochranza on the 9.30 ferry to Claonaig and climbed uphill across Kintyre before dropping down to Kennacraig. If you looked back from the top there would normally be a splendid view of the Arran peaks, but they were lost in the mist. The next bit was along the A83 to Tarbert, but that is reasonably flat and was not too busy. Its verges were disfigured with lots of discarded cans, bottles and other litter. After coffee at Tarbert we took the ferry across Loch Fyne to Portavadie. From there we took a switchback road, the first bit having a concrete surface, to Tighnabruaich. There we had a good lunch at the Botanica restaurant, which specialises in sea food; three of us had some well-presented kedgeree. Leaving Tighnabruaich the road climbs high above the shore of the Kyles of Bute, with wonderful views down into the Kyles themselves. By then the mist had gone and the sun was starting to appear. Half-way up the climb is a rock painted to look like a dragon. The road is frustrating, as you think you are at the top with a downhill stretch ahead, but then it rises again to a higher summit... and another... and another... and just as you feel like giving up you come to a viewpoint 170 metres above sea level where you look down the East Kyle and up Loch Riddon and can see the rest of the day's route and know that the worst is over. The final stretch to Rothesay was into a headwind. We were too tired to rush for the 6.00 ferry so we headed for the 7.00, the last of the day. Arriving at Rothesay in sunshine there was plenty of time to celebrate a better-then-expected weekend with the first ice-cream of the season. Then home. An old suburban train squeaked and rattled from Wemyss Bay to Glasgow, then we made a 12-minute connection between the stations, and took a quiet and comfortable electric train on the newly-electrified line from Queen Street to Edinburgh. We got back home about ten o'clock, tired but cheerful. We were nine for Mellow Velo’s first venture of the year, setting off after coffee in the sun from George Place, Bathgate. The sun shone for much of the day and bottles of sun tan lotion even appeared! The ride took us down Whitburn Road (B7002) and shortly left onto cycle route NCN75 to cross the river heading west. We followed this off-road route to Blackridge (7 miles), turning north there onto the B718 to climb around Eastcraigs Hill to Gowanbank. Joining the B8028 we dropped down into Avonbridge, forking right at the second church to climb on the B825 for magnificent sunny views. Second right for Candie-end and left to meander down to and across the A801. From there, almost immediately on the left, we took the track into Muiravonside Country Park for lunch at the Steading Café (01506 671290) (15 miles). Service was slow as there was only one poor soul taking orders, payments and then catering but the microwave did a great job and we were in no rush. We retraced our route back to the car park and then continued out to re-join the B825. The road crosses the Union Canal and bears sharp left at which point we pushed our bikes up the short path and left onto the towpath. This took us on a scenic ride via the Avon Viaduct to Linlithgow, the ice covering the canal experienced during the recci having since melted. The shadows of the viaduct stretching out beneath us as we crossed were memorable. After the scenic amble along the towpath our legs were woken by the steep climb up Preston Road towards Beecriags Country Park. The reward was further fantastic views across to the north-west. The majority detoured along a path from here coming out just north of Beecraigs. 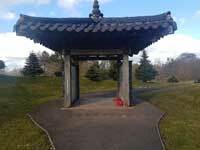 Having re-grouped we skirted around the west side of the Park to the Korean Wall Memorial for a short break. Continuing on we turned left and then right, climbing sharply to Cairnpapple but taking our next rest at a ring of standing stones. Reflecting their age and history we were right by the local farmer who admitted the ring dates from the millennium and is therefore only 18 years old! A few went on ahead for an earlier train or to greet the car, whilst others climbed the hillock of the Knock on foot for a spectacular 360 degree view of the surrounding area, including the three bridges. The sun continued but the wind was bitter up at the top. 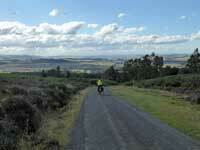 From there it was a relaxing drop down to crossroads, a right turn onto Drumcross Road and downhill into Bathgate. We continued past the left turn off for Majoribanks Street onto Hopetoun Street, took the next left which runs back down to the A89 and the station (25 miles total). The early train hadn’t yet left so all six train travellers managed to journey back together. Welcome back to cycling, Mellow Velo, and a sunny start to 2018.